The system of Chakras is an important concept in the interaction of stones with humans. This is a fundamental concept for those who believe in metaphysics and alternative healing. While many people are skeptical this can be proven. Entire books can be written on the subject of Chakras and it's related topic Energy Fields/Aura. So I'll try to be as brief as possible while presenting this concept in a simple manner. Firstly, there is the basic science that everything in this universe is made of matter and energy. Energy can be in many forms from visible light to invisible energy proven by science, like nuclear radiation and latent heat of crystallization, etc. Note that invisible to us human beings does not necessarily mean that other creatures cannot see the energy. And what is undetectable (by machines) today does not mean it is not there. It simply means that we cannot detect or measure it for now. Then there is the invisible energy generally called Universal Energy(UE). This energy has been called Chi, Prana, Ki and Vital Energy amongst others. This energy permeates the universe and interconnects all things. It is believed that this is the most basic energy and all other types of energy are manifestations of this energy. Generally, it is good enough to know that there are many types of energy and UE is a type of energy yet to be proven(detectable) by science. However, it has been experienced by many, especially spiritually-inclined people like the Yogis and others who meditate. Thing is, ordinary folks like you and I can use stones and crystals to increase our sensitivity to it. Science has proven that matter contains energy. Anything that has energy will generate an energy field. It's just whether the field is visible or invisible, detectable or undetectable. The Sun and stars are examples of objects which have visible energy fields. Stones and crystals have invisible energy fields. Human beings and other living creatures like plants and animals have energy fields too. It is commonly known as the aura or our “etheric field”. This field (Fig.1) is essentially generated by our bodies through our Chakras. “Chakra” means “wheel” in the ancient Sanskrit language. The body has energy centers that look like spinning wheels/cones (Fig.2) and are called Chakras. 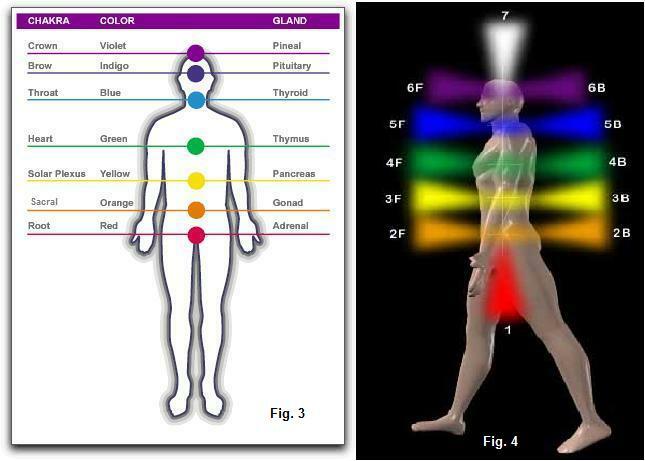 They allow energy to flow from one part of the body to another and generate our aura or energy field. Our aura is more related to scientifically-unproven UE than any other energy known to man. In fact, the aura and Chakras are parts of our Energy Body. Machines have been developed to capture the Kirlian image of our body thus showing us what our aura (part of our Energy Body) look like at that moment in time. In general, there are 7 Major Chakras on our body. Each chakra emits energy that is closely related to invisible colored light. Interestingly these chakras are located at or near glands of our endocrine systems and they have been found to be correlated (Please see Fig. 3 and Fig.4.). Any disease in organs will show itself to clairvoyants who can see auras or to healers who can feel and test auras and chakras. Similarly, any imbalance in the chakras or aura will manifest itself in the corresponding part of the physical body. Therefore, disease and dis-ease can be caused by problems in our aura/energy field and/or at chakras. While disease is physical, dis-ease can be psychological, emotional or even of energy-origin.